…but I thought it was more useful than just writing it was possible in a discussion section. …but I knew that no-one else had done it before and thought it might be helpful to someone. When have you gone the extra mile in your PhD? When have you done something, big or small, that maybe wasn’t essential but which helped? Make a list of what and why. Don’t play them down. They can show others your drive to do something valuable for your field. It’s been some time since I’ve posted a new episode, and I’m sorry to say that there might not be another before the end of 2016. Episode 63 came out a few days before we went on a family holiday. When we came back we had the convergence of a busy work period and our daughter started nursery, which has added a new adjustment to the flow of our daily lives here at Casa Ryder. It dawned on me recently that I had forgotten to follow up with a few people who had volunteered to come on the podcast – and then it dawned on me that I had forgotten to even promote the podcast through the Twitter feed. Recently, I’ve been working on a few new projects and a few old ideas, and the podcast has slipped through the cracks as a result. And I need to do another Q&A episode, because I enjoyed the challenge of making the first one. If I spend a bit of time now and think it through, make a proper plan, then I can get 2017 off to a good start! …if you’ve been in touch before about coming on the podcast, expect an email in the near future. If you’d like to come on and share your research and viva experiences, then please get in touch. If you’re looking for viva experiences from a wide range of PhD graduates then check out the Archive. And if you’re looking for a bit of extra support then check out my ebooks and print offerings – including the ultra-concentrated Viva Prep Handbook! Thanks for reading, thanks for your support and thanks for listening to the podcast. Viva Survivor Workshop Update 1! I’m delivering the workshop on June 29th, and full details and booking info are on this Eventbrite page. I’ve explored the why of the workshop a little in a blog post last week – I want to offer something valuable to PGRs who I might not normally be able to connect with, and I want to stretch myself with an interesting challenge. Yesterday I shared something about Ziferblat, the great venue in Manchester that will be our host for the workshop. 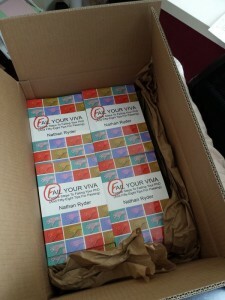 I’m writing a blog post soon for my main work blog about books, but here is a sneak peek: I’ve created a paperback print run for my first book Fail Your Viva! Participants at the workshop will receive a copy as part of their participant pack, and I made a print run of 100 copies to be able to offer the book directly. I’ve created a books page where you can order them from me, and have a stack of padded envelopes ready and waiting to send them on their way. I love reading books on my Kindle, but there’s something awesome about a print book. If print is more your thing, then maybe this is what you’ve been looking for! Check here for more details. Thanks for reading – check out the Eventbrite page for more details, and if you know someone who might be interested then feel free to share this with them! One of the few podcasts I regularly listen to is the Tim Ferriss Show: I highly recommend it, Tim interviews people about how they manage to be excellent in their fields. It’s a wild ride sometimes, and he has a huge variety of people on his show. I don’t think that the Viva Survivors Podcast is a “wild ride” but I think it’s great that there is such a variety of PhD graduates who come on here to share their experiences. A few times now, Tim has had special Q&A episodes and listeners ask him all kinds of things – anything and everything really. It struck me a month or so ago that this might be a useful thing to do on Viva Survivors, at least every now and then. I used the poll function on Twitter to see if this was interesting to followers, and got a couple of positive votes, and also heard from several friends to say that this was a neat idea. The Viva Survivors Podcast is almost three years old! I can’t believe it personally, it seems like only yesterday that I was sat on my friend Shaine’s couch, hoping that the app I had downloaded was going to work fine and that his daughter would stay asleep while we chatted about his research and viva. Forty episodes later and here we are. I’ve had to take time off every now and then, but am really feeling back in the flow again now. Part of this is having a loose schedule to work towards, of releasing two episodes a month, give or take. This has been easier in the last six months because at times I’ve recorded several podcasts in a very short space of time and then released them every few weeks. PhD Graduates: full time, part time, recent or from years ago, I want to hear from you and hear all about your research and experiences. Many more people want to hear what your viva was like too! Academics: I’ve so far made two Academic Job Specials, and these have been really popular in helping people think through different aspects of pursuing and maintaining academic jobs and careers. Academia is in the mind a lot around viva time for many people – your experience and advice could really help. Examiners: Have you examined PhD theses and conducted vivas? You have really valuable ideas about the other side of the viva, and this could be hugely helpful to those who listen to the podcast. Dr Katy Shaw shared her experience of being an examiner in Episode 32. Your advice could also really help. I’ve got a few weeks coming up where I will be largely working from home; I’ll be using some of this time to play with my daughter, some of it to start writing my next book and I want to use some of it to record the summer slate of podcasts. It may be that if you were interviewed in the last week of May that your Episode would not debut until the end of August – but if you have the time now it will be hugely helpful in maintaining the podcast this year. If you want to come on the podcast, for any of the three possibilities mentioned above then please get in touch – either email me, tweet @VivaSurvivors or @DrRyder or leave a comment on this post. If you know someone else who would be great to have on the podcast, or have an idea of a viva-related area that you think would be good to explore then let me know too. I’ve loved doing this podcast for the last three years, and look forward to doing it for a long time to come. Please help me make that happen. PS: I have a new book out! The Viva: Who? What? How? is out! The Viva: Who? What? How? is out now! An ebook. Twenty-seven chapters, nearly 20,000 words, and answers to the most frequently asked questions about the PhD viva in the UK. I deliver viva preparation workshops, and over the last five years I’ve got a great understanding about the questions that distract PhD candidates. This book helps eliminate those distractions. There are more details below, but if all you want are the purchase links, here they are! In the UK, The Viva: Who? What? How? is in the Kindle Store here. 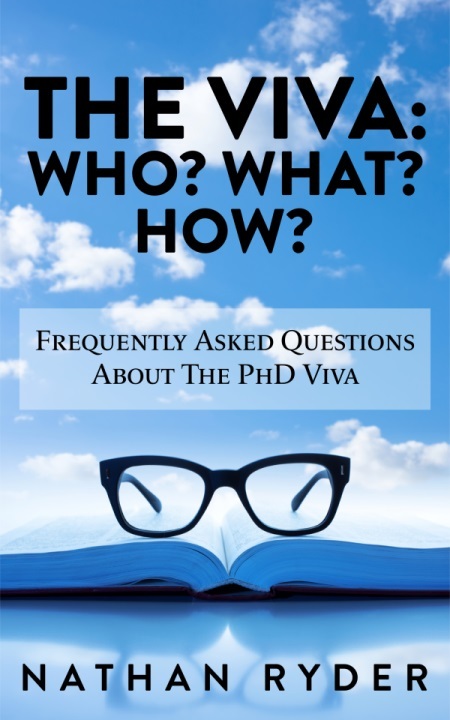 In the UK and around the world, The Viva: Who? What? How? is available from Payhip here. In this episode I’m chatting with Dr Robin Wilson, who had his viva in January. Robin’s PhD at the University of Southampton was in remote sensing, and it was really interesting to hear about how he got interested in that area, as well as the results and applications of his research. Robin also shared some of his experiences of doing his PhD in a Doctoral Training Centre – something that is becoming more and more common. You can find Robin on Twitter as @sciremotesense. If you’ve got any questions or comments about this episode, then comment on this post, tweet @VivaSurvivors – or email me! And please get in touch if you’d like to appear on a future episode. I’m always looking for more PhD graduates who are happy to share their research and viva experiences. I’m also looking for academics happy to talk about Academic Jobs or what it is like being an Examiner for future specials. As a pure maths PhD graduate you might expect me to be in love with numbers a bit. To think that they are quite special in fact. And I do! I’m just amazed by how amazing they are. For example, it’s possible to calculate how large a sample you need to take from a population in order to get results that reasonably represent that population! And that’s exactly what I’ve done for tinyurl.com/VivaSurvivorsSurvey. 384 is the magic number: 384 responses from PhD graduates of UK institutions will help to make sure that the pool of data I’m drawing from is as valuable as possible. 384 responses means that I can be 95% confident in the conclusions I’m drawing, and also give me a reasonable interval around the numbers that come out. 384 responses by 30th April… Thankfully, I’ve been very fortunate so far by the responding and sharing that people have been doing on Twitter and in other places. At the time of writing (11am on April 23rd) there are 245 responses to the survey, and however many I get I know that the results are going to be really valuable to the people I share them with… But if I can, I would love to hit those “significant” numbers! Seven days, 139 responses. Can you help? If you’ve not taken the survey yet, there are seven quick questions – it will take two minutes of your time and it’s here: tinyurl.com/VivaSurvivorsSurvey. Thank you! If you’ve completed the survey, and can share it any way shape or form, even to just one other person, please consider doing so. I can’t wait to start analysing the data from this research, and to see what the responses say, and what picture they paint of the viva from the perspective of PhD candidates/graduates. And when it is complete, it will be the start, not the end of research in this area for me. Best to finish one project first though! If you have any questions about this research (tinyurl.com/VivaSurvivorsSurvey) please get in touch, it would be great to hear from you. PS – there is a new podcast today! The outcome I’m aiming for! On Tuesday I was fortunate to be asked to deliver a Creative Thinking and Problem Solving workshop at LJMU. I love helping people explore creative thinking, and as part of the activities that we looked at I mentioned the survey and the outcomes I’m aiming at. Looking towards outcomes can be a really helpful part of the creative process. 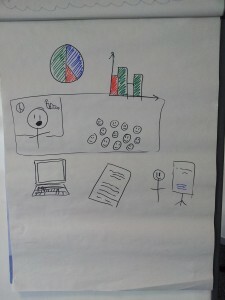 After using a series of questions to explore some of the facts and feelings that people had about the outcome they wanted for their challenge, I encouraged the participants to create a picture or some images that represent the outcome they want. To illustrate this I doodled the image at the top of this post to show the outcomes that I’m aiming at for the research from this survey. Second, I’m excited about the possibility of presenting the outcomes of the research to others. I’ve accepted one invitation already, and am happy to be contacted about other opportunities. The bottom row of images show the ultimate aims: I’m hoping that this research will allow me to write and share more on the viva, to help PhD candidates and those who support them. 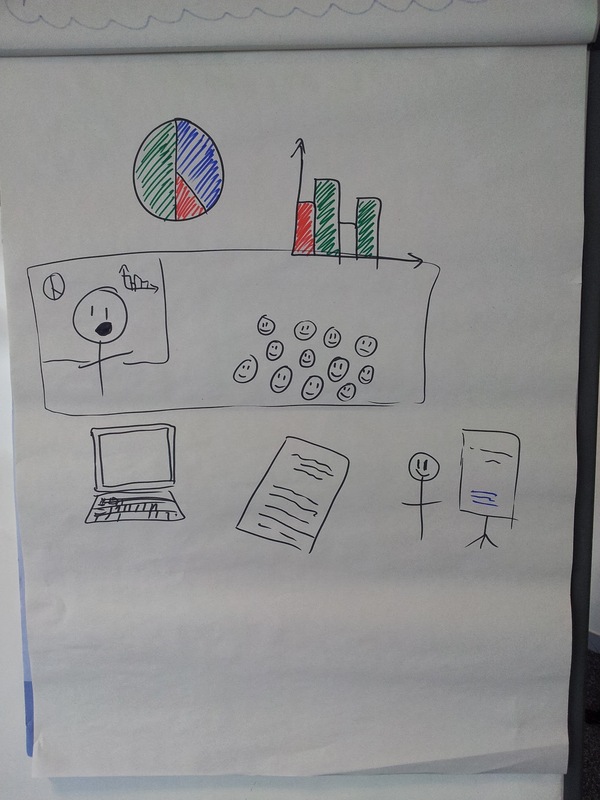 And I’m really hoping that this will inform my own best practice in the viva preparation workshops that I deliver. So if you haven’t responded to my survey yet and would be eligible to – looking for PhD graduates of UK institutions since the year 2000 – please click on this link: tinyurl.com/VivaSurvivorsSurvey. And if you are able to share this with friends, colleagues or your Twitter followers that would be a massive help! Further posts on the research coming soon… Thanks for reading!